You can make yummy pumpkin gingerbread just like they serve at Starbucks. And much cheaper! It’s super easy and it makes your house smell wonderful! 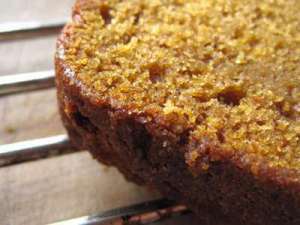 I’ve tried many pumpkin bread recipes and this one always comes out as our favorite. We love it with homemade apple butter. It makes a much appreciated gift too! This is a great holiday recipe and is quick to throw together. You can freeze it to use for Thanksgiving or any other holidays. It’s also great to have handy for unexpected guests. Invite a friend over for coffee, eggnog, tea, etc. and serve a slice of pumpkin gingerbread. It makes a wonderful dessert with a scoop of good vanilla ice cream. I mix this recipe by hand, but you can use a mixer if you like. Preheat oven to 325 degrees F. Lightly grease two 9x5 inch loaf pans. In a large mixing, combine sugar, oil and eggs; beat until smooth. Add water, pumpkin, and beat until well blended. Stir in walnuts and/or dates. In medium bowl, combine flour, soda, salt, baking powder and dried spices. Add dry ingredients to pumpkin mixture and blend just until all ingredients are mixed. Divide batter between greased pans. Bake in preheated oven until toothpick comes out clean, 50 minutes to 1 hour. Cool completely before freezing. Label and date the wrapped loaves. Put a few loaves of this moist bread in the freezer for the holidays. You can serve it any time of day or night. This makes a nice hostess gift or neighbor gift too. Everybody seems to love it! I’m always on the lookout for recipes that are easy, affordable, and luxurious. I also love that these recipes save money all the while I’m eating the best! Click here to discover some of the most popular recipes here on Square Pennies. (You can find these top recipes anytime by clicking on the “Money Saving Recipes” tab at the top of every page.) I hope you find some new favorites! Click here for more favorite pumpkin recipes on Square Pennies. My pleasure. I like that it’s only 15 minutes to throw together. And the delicious aroma in the house is a bonus! Hope you like it!